The last time the John F. Kennedy Baseball Team won a metro title was 2014, they had an all-star lineup mostly full of seniors and juniors. Each season since 2014, they would fall short of that goal but not by much. In 2019 boy’s baseball team has the chance to become the metro champions once again. Many returning sophomores, with juniors from the year before as well, returned to the team, hoping to take the number one title. They had momentum from the bond they created from their last season. “The bond between my brothers is unbreakable. Not only are we brothers, we’re family,” says Zach Enos (℅ of 2020). Enos was a varsity player as a sophomore along with many of the other sophomores who were moved to varsity near end of the season. It was good experience for the younger players and had prepared them for the next year. With the baseball squad full of experienced varsity players, the hopes of winning metro were high. Halfway through this rainy season, the boy’s baseball team would prove they were ready to compete for title, as they had a winning record of 5-2 in metro. Through the scrappy play of the boy’s baseball team, they were able to beat River City, McClatchy, Grant, and Monterey Trail. Ben Van Eskridge (℅ of 2020), varsity player, explains his main goal, “The goal is the same for every game. Win as efficiently as possible.” This would prove to show when they played Monterey Trail twice in a row, outscoring them 16-1 and 17-2. They also played River City twice in a row, but were less fortunate, only defeating them 1-0, in one match. The same event would occur again, against McClatchy beating their rival team 2-1. The team was able to easily beat Grant in a high-scoring game of 6-2. These great wins were hard-fought for in each match, showcasing the boy’s baseball team’s talent. Their two losses were to McClatchy and River City. The lost against River City was an intense game, losing by one point: 11-12. The first five innings were a non-stop battle of scoring and good gameplay. The team would come close at the last inning when Kennedy needed to stop River City from scoring one point, but weren’t able to come out on top. The other loss was to rival, McClatchy, losing 3-0. The two losses were tough on the team, but it made them more motivated to work harder. 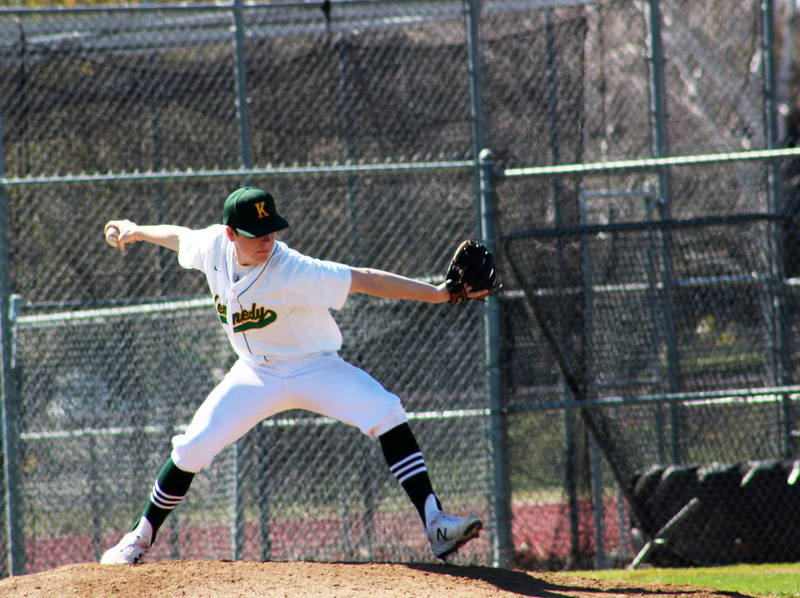 The first half of the season may have been a slow start, but it was a wake up call for Kennedy’s baseball team. It showed them that there were many other competitors in the league, and that winning league champs, wouldn’t be an easy journey. They will have to work harder than usual, and regain confidence to finish strong through the second half. Justin Mason (℅ 2022) takes a good attempt to swing at the baseball against the opponent.